For better or worse, X-Men: Days Of Future Past is the first Marvel movie to truly embrace comics-style storytelling. Context-less and origin-story-free, it presumes that its audience is familiar with all relevant character traits, continuities, and fantastic elements. It returns the genre to its geek roots; depending on the viewer, it has the potential to be the most narratively satisfying and fluid entry in the X-Men film series, or the most alienating. It’s a loose adaptation of one of the all-time great Marvel storylines, with Professor X and Magneto using Shadowcat’s powers to send Wolverine’s consciousness back in time to 1973 so that he can help their past selves set aside their differences and avert a dystopian, Sentinel-run future by preventing Mystique from assassinating Bolivar Trask. Readers who are confused by any or all parts of the preceding sentence should take it as a warning. Not to say that the movie is a fans-only affair through and through. Director Bryan Singer—whose original X-Men from 2000 jumpstarted the current superhero-movie boom—has become a more confident stylist, and Days Of Future Past is distinguished by several extravagantly designed effects sequences, including a slow-motion shoot-out set to Jim Croce’s “Time In A Bottle” and an opening battle that pits space-warping Blink (Fan Bingbing) against a gaggle of Sentinels, with combatants leaping through portals that appear as different spatial planes on the surface of the 3-D screen. The period signage—lava lamps, shearling coats, wocka-wocka guitars, Sanford And Son, Pong—is broad enough to occasionally register as parody, and like its predecessor, X-Men: First Class, the movie has a lot of fun integrating historical events into its fictional universe. The Paris peace accords, the JFK assassination, and the missing 18 minutes from Nixon’s Watergate tapes all get an X-Men spin. It doesn’t take a specialist to enjoy any of these things, but understanding the plot, the characters, and their actions is a different matter. No blockbuster sequel in recent memory has put so little effort into involving first-timers; it requires a familiarity with X-Men: The Last Stand and X-Men: First Class (as it functions as a sequel to both) and a working knowledge of the source material. Viewers who don’t know that Wolverine (Hugh Jackman) is supposed to have an adamantium skeleton or that Quicksilver (Evan Peters) is Magneto’s son will be confused by certain scenes. 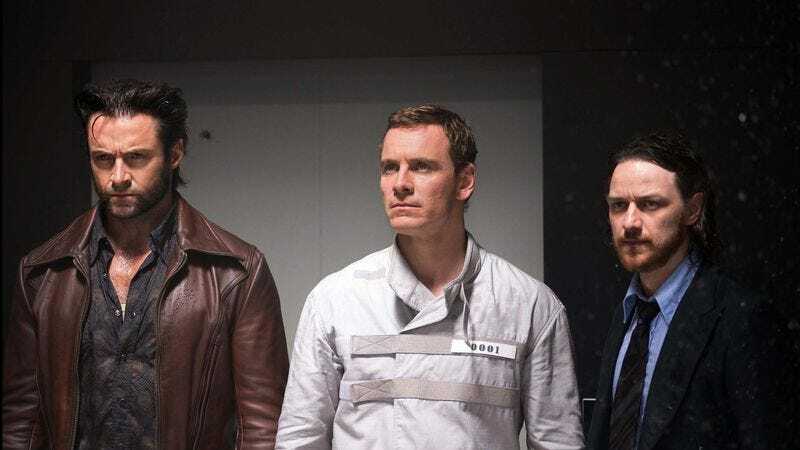 Those unfamiliar with the X-Men—the differing personas of the older Professor X (Patrick Stewart) and Magneto (Ian McKellen) and their younger selves (James McAvoy and Michael Fassbender, respectively), or their relationship with shape-shifting Mystique (Jennifer Lawrence)—are likely to be confounded for the most of the movie’s 131 minutes. The satisfaction of watching any given actor comes half from performance, half from interpretation. At its laziest, this kind of extra-textualism ends up producing something like the final act of Star Trek Into Darkness, in which the only entertainment comes from rephrasings of Star Trek II: The Wrath Of Khan. Days Of Future Past, on the other hand, is geek storytelling done right, more or less. Rather than leaning on references for fan entertainment value—what critic Pat Graham, writing about the original Star Trek movies, once called “the ritual appreciation of familiar iconography and themes”—the movie uses the audience’s presumed fandom to move faster and go further than it could if it were continually stopping to reintroduce characters and explain the setting. It’s not a coincidence that, in addition to being the least newcomer-friendly big-budget movie of the year so far, Days Of Future Past is also the most narrative-driven. Juggling (and reconciling) different versions of the same characters across multiple timelines, it produces something akin to the sprawl of a decades-old superhero universe. For thoughts on, and a place to discuss, the plot details we can’t reveal in our review, visit X-Men: Days of Future Past’s Spoiler Space.